Eduard Lintner, former German deputy Interior Minister: I admire the resoluteness and courage with which you carry out this battle. The economic situation is becoming ever more disastrous. The regime squanders enormous amount of money abroad, or they steal from people and put it in their pockets. The US has declared the #IRGC as a terrorist organization. The #Canadian gov. has been urged by the parliament to severe its relations with #Iran. The #German Gov. 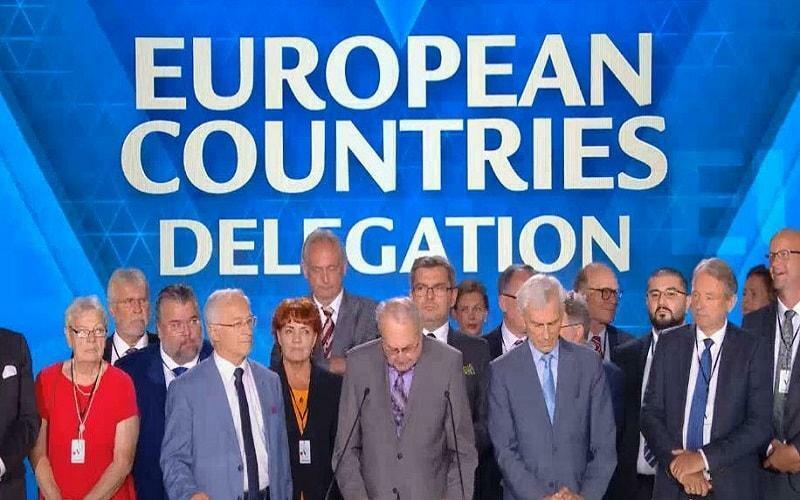 has also respected the Iranian Resistance by asking the Iranian government to respect the rights to demonstrate in public & German security authorities continuously warn against the #IRGC & its activities. We believe the situation is turning in the right direction for the people of #Iran. The German government stands by your side and by your struggle for a #freeIran. It is in our best interest. Martin Patzelt, Member of German #Bundestag : Salute to you and all your families and relatives in Iran. Those bold people who have taken to the streets in Iran. I admire your courage. The time is up for dictators in #Iran. The National Council of Resistance (#NCRI) has contributed greatly to this struggle for freedom in #Iran. This Resistance has a courage & bold leader. She does not budge an inch from her position to fight for all ppl.